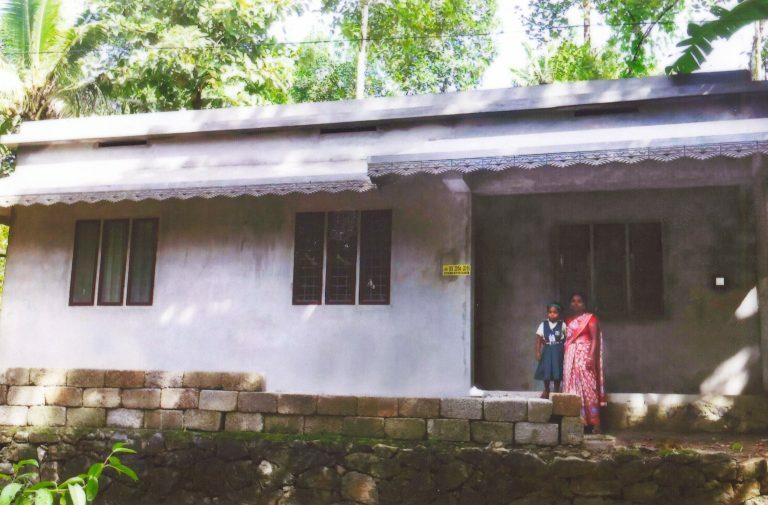 These recently constructed homes are life changing moments for our families in need. They would like to express their gratitude. I am Alexander. My family consists of my wife and a daughter. Daughter Aleena is in 10th standard. I am a patient and having medicines continually. 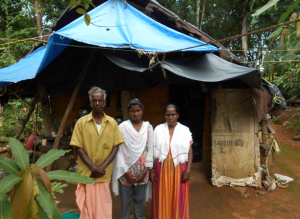 Because of my ill health, I find difficulty to earn money for livelihood and medicine. And I didn’t have a proper house and I was unable to build a good house. I happened to meet vsss Director and I submitted my helplessness to him and I express my desire to have a good house. 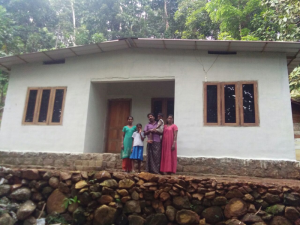 Out of your generosity you granted a project to build a house for me, though there were many other necessities, in spite of that, you could grant me a good house. I believe that God will grand a great reward to you all. Really I am very grateful to you and I express my gratitude from my heart and I assure you my humble prayers to you all. I express my heartfelt gratitude for the immense help received from the we share benefactors through Vijayapuram Social Service Society. 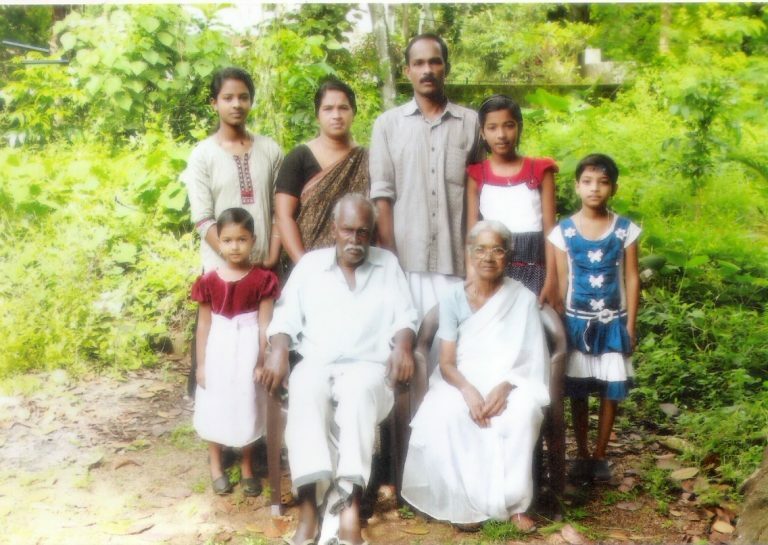 I am an autorickshow driver in Munnar town and the only bread winner of the family. My family consists of five members; myself, my wife, two daughters and a son. All my children are pursuing education. 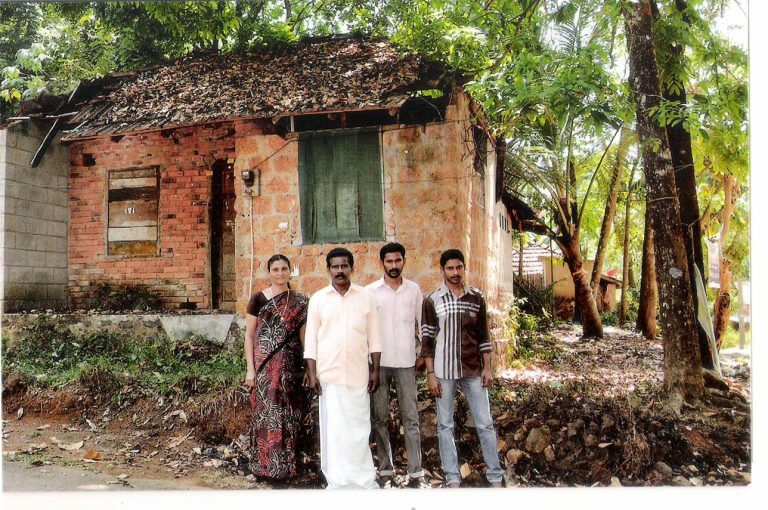 We had a small house which was in a dilapidated state. It had no much space for doing self studies by my children or conducting prayer meeting of small Christian communities. I had no scope to rebuild a new house with my own resources. Therefore I resorted to seek help of good hearted people. 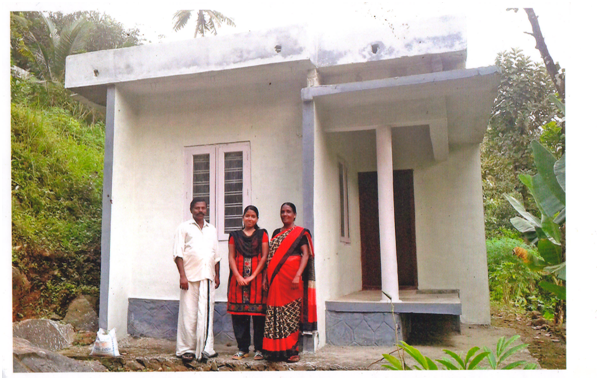 I was fortunate to complete the construction of the house sanctioned. Now my family lives in the new house with pride and pleasure. Children are having adequate space to do their studies without any disturbance. Monthly prayer meeting of the family unit can be held in my house because there is a spacious hall in the new house. I have no words to express my gratitude. Every day we all remember the benefactors in our family prayer. How are you? Hope you are keeping fine. We are very eager to know your news. What is the present season there? Here we have monsoon season with heavy rain and flood. The school is re-opened and both our children go to school. 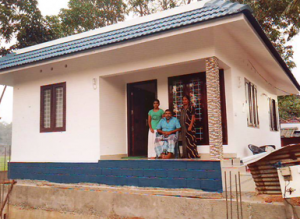 We have completed the construction of our house. We thank you very much for your love, concern and support, without which our dream of a house would not have been realized. We assure our sincere prayers for you and we would remember every day in our family prayers and Holy Mass. We request you to remember us in your prayers. 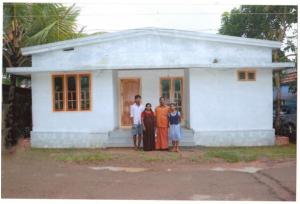 We are furnishing here with the photograph of our new house. From the bottom of our heart we once again thank you for your love and concern for us and for the financial support you have extended to us. Thank you very much for your help for our family to have a wonderful house above my dreams. We are so sad because our Vishal is not with us to share this blessing. I am sure that he will be happy at heaven to know that his wife and children are safe in a good house which was his life long dream but not fulfilled in his life time. We thank all of you who contributed to my house. My two children Alvin Vishal and Asnamol Vishal are school going children and the elder one is in 10th standard and younger one in 5th standard. Schools have reopened in June. They are studying well. My mother is with me after the demise of my husband. We remember you in our daily prayer Please do remember us also in your prayer. We are grateful to you for all the help. How are you ? Hope you are keeping fine. What about your family. Are you all keeping fine? I am writing this letter with much love and gratitude. Because my life situation is very poor. We didn’t have a good house. Every day we prayed for a good house. I could not make a house alone. I can’t do any work regularly because of my health problem. Now with your help I could make a good house. It is the ever memorable event for us. We are praying for you every day in our daily prayer. Now myself and my family members are very happy. Specially we are thanking to God for you. May the God bless you all abundantly. We all are keeping fine. We are actively participating all the programs in our parish. Now we have much conveniences in this house. We can conduct here family unit prayer nicely. For all the goodness myself and my family are thanking you. We will pray for you every day. May the CHILD JESUS bless you all. We wish you A HAPPY CHRISTMAS & A HAPPY NEW YEAR. With much love and prayers. P V Sebastian and family. Hope you & your family members are keeping fine. Myself and my family members are keeping fine. What is the climate there? Winter is starting here. My family consists of my wife and our daughter. She is studying in +1. We have not a good house till now. Besides My daughter has no convenient place for the study. Our Good God gave reply for our prayer. Now we got a good and beautiful house. Our daughter’s friends was likes to come home. But she didn’t allow them because of the bad house. She is very happy to invite them all in this new house. 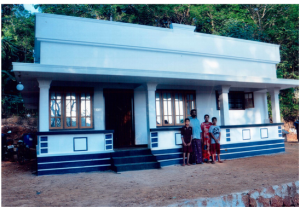 My wife’s house, they are 4 daughter’s. 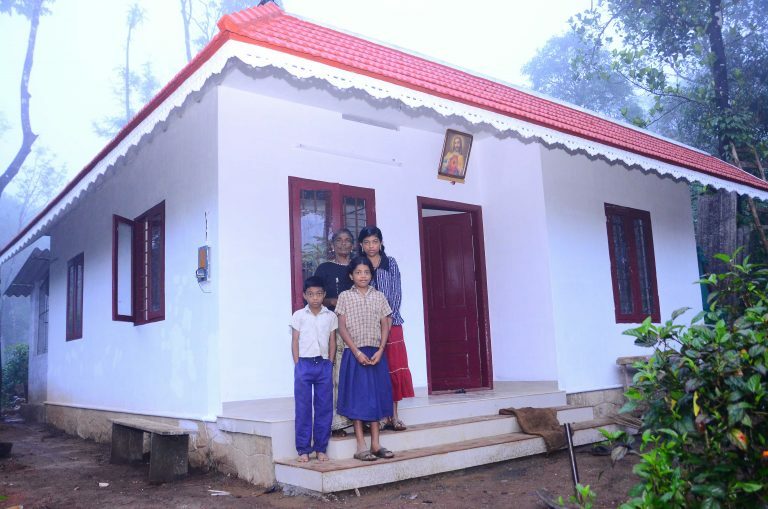 Three of them have good house. 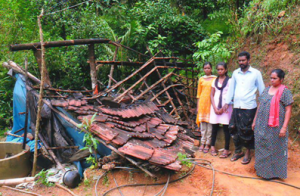 My house only was in bad condition. So my wife also is very happy. While our parish priest came for blessing our house it was very bad . 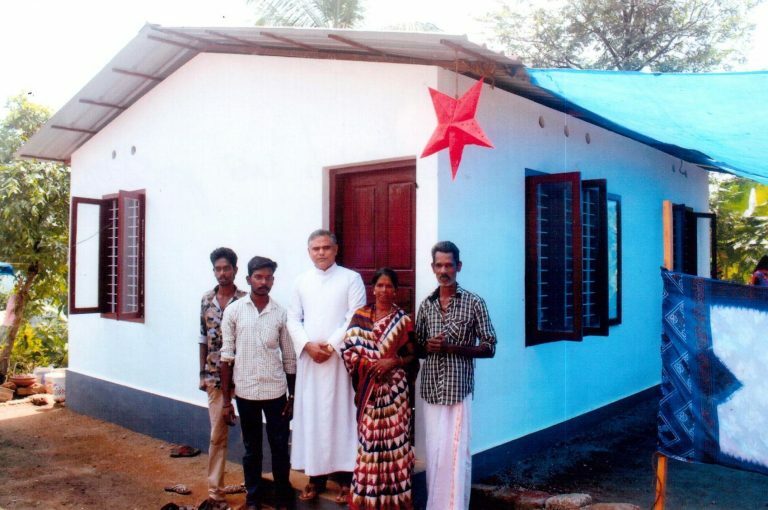 Our vicar specially prayed for a good house . 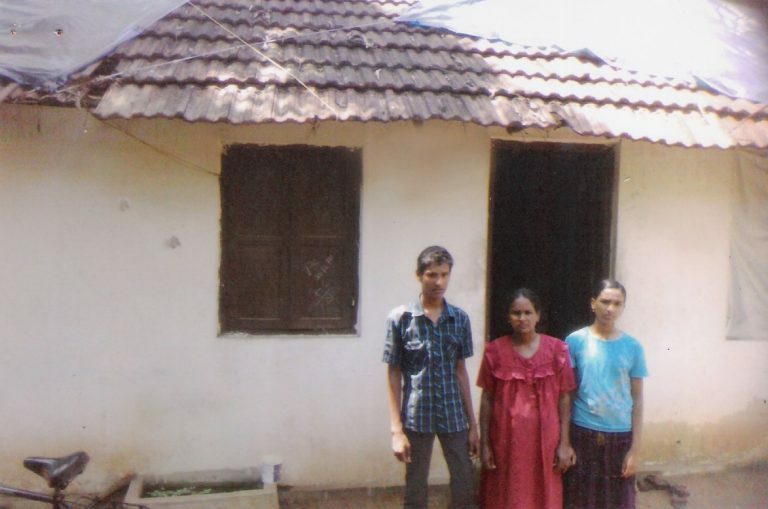 Dear loving Sponsors, we were suffering a long period of time for getting a house of our own. We prayed for this intention for many years. Now we are grateful to our Almighty for this happiness. We are standing in thankful mind before you and all for this new house. I was unable to make a house by myself. 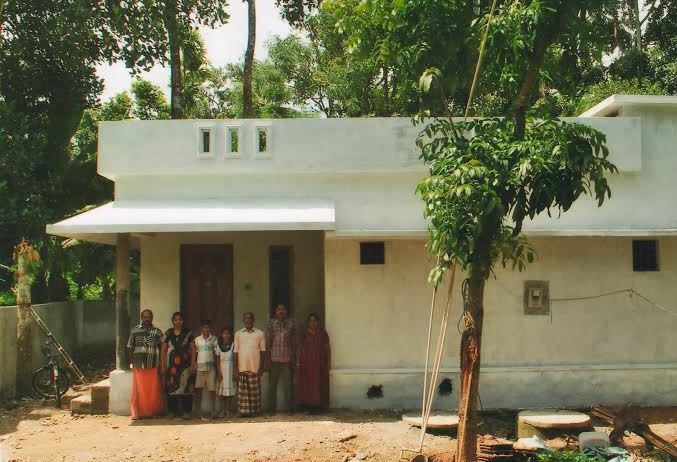 In this painful situation we got this house through WESHARE. We are thankful for your help. Here we all are keeping fine. I am going for the job. My wife and children are doing well. My two children are studying in good manner. 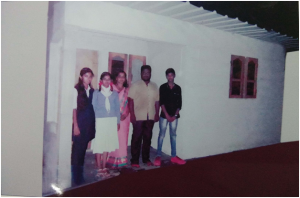 In the new house they are more interested in studying and welcome friends for combined study. We are so happy and we will remember you every day. We will pray for you all in our daily prayer. We are sure that you will pray and remember us. We welcome you all to our house. Once again we Thank you with much gratitude and prayer. We lived 17 years in a rented house. 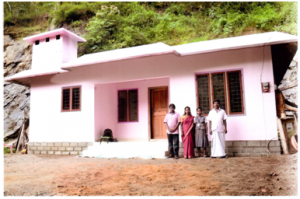 But now you (The Bishop of Vijayapuram and the director of VSSS with the help of "We Share Program") granted a beautiful house. We are grateful to you, and also giving prayerful wishes. Specially we are praying for the sponsors of good people. And for their family members and parents. May the good God bless them abundantly. Now, myself and my family members are happy in our home. Once again we thank you for your helpful service. Hope you are fine and doing well. Here my family and myself are fine and doing well. 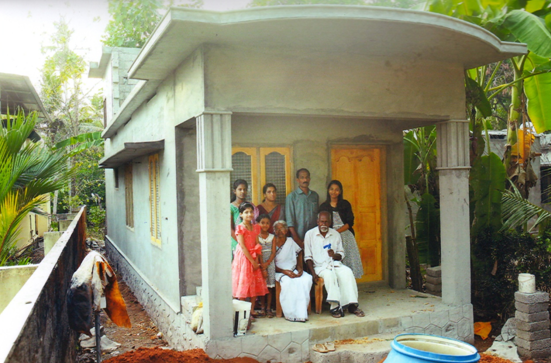 We are grateful to you for the help you have provided for the construction of our House. 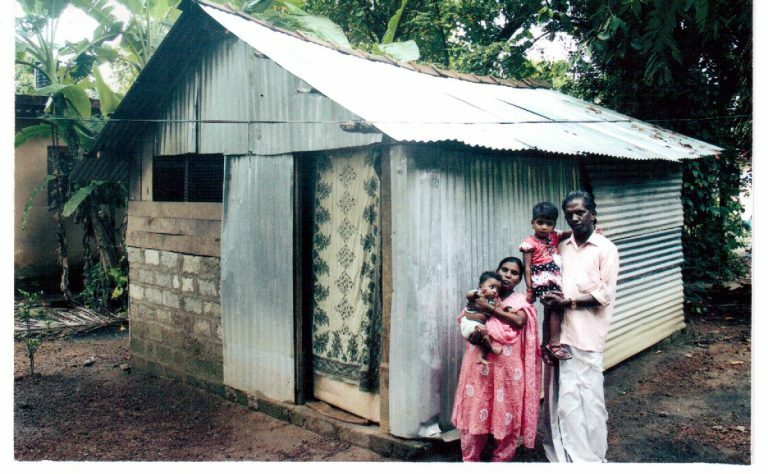 We can never forget you and your concern towards us, we were not having a house and living in a shed. Our surprise is not yet over. Whenever we see our house we thank God for you as well as VSSS. We had great opportunity to hang the Christmas Star in front of our house. We celebrated the Christmas with great joy. You made it possible. Once again thank you so much for everything and praying for God’s Blessings up on you and your undertakings. I am Benny K. I am having three children. 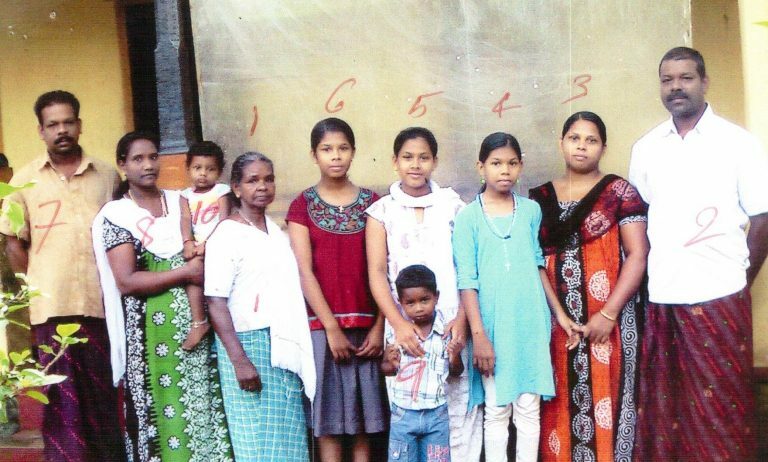 Two of them are girls, the eldest one is studying in eighth class and the second one is studying in fifth class. And the third one is a boy and he is studying in LKG. Till 2014 we were living in a shed. Those days we were worried about not having a proper shelter. God saw our struggles and sent you like a guardian angel to help us. 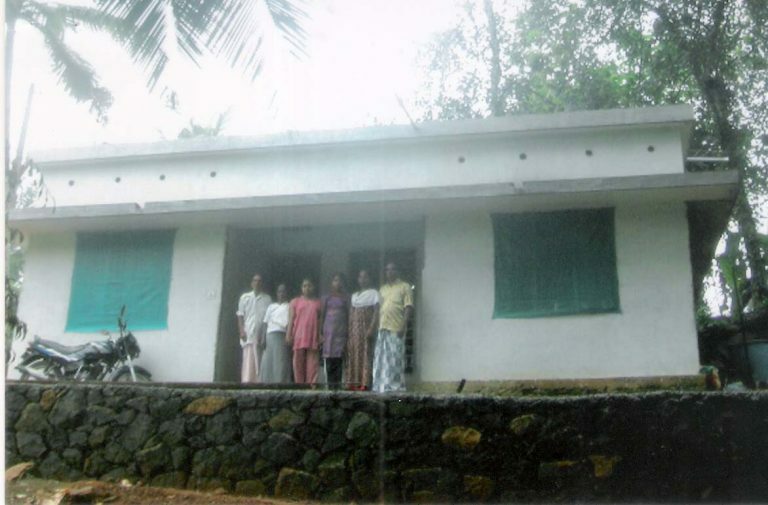 Thank you for your financial support which enabled us to construct a house. 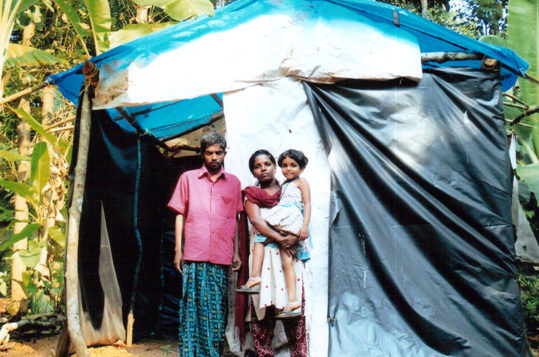 I wish that many of the families may be helped by you through the VSSS. I am thankful for the We Share program. I remember you in my prayers. We are ever grateful to you. We thank God for you and we assure you our prayer full support. Here my mother and I are fine and keeping good health. 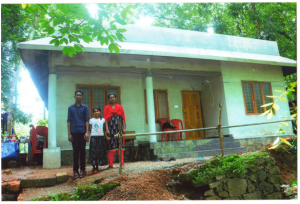 Because of your help we could own a house. I also had the luck to live with my mother in the new house. I am experiencing the happiness of living in our own house. We have no words to express our thanks to you. 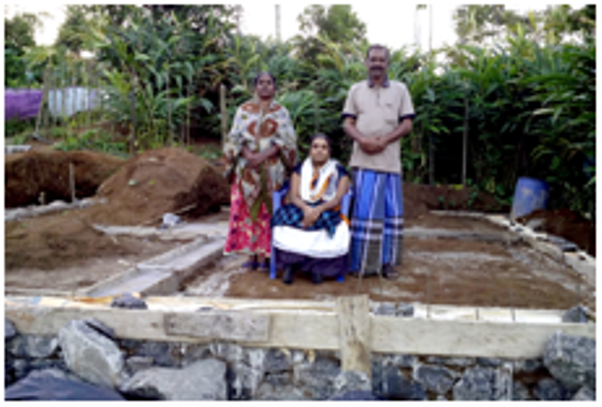 You have taken lot of effort to help us to build a house. Thank you so much for your love and concern towards us. Once again I thank you for the support and love. 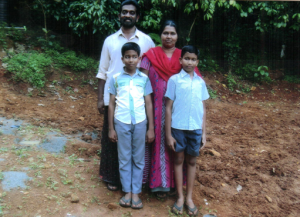 Greetings from Josekutty and family .We are over flowed with joy and happiness to express our gratitude towards you. 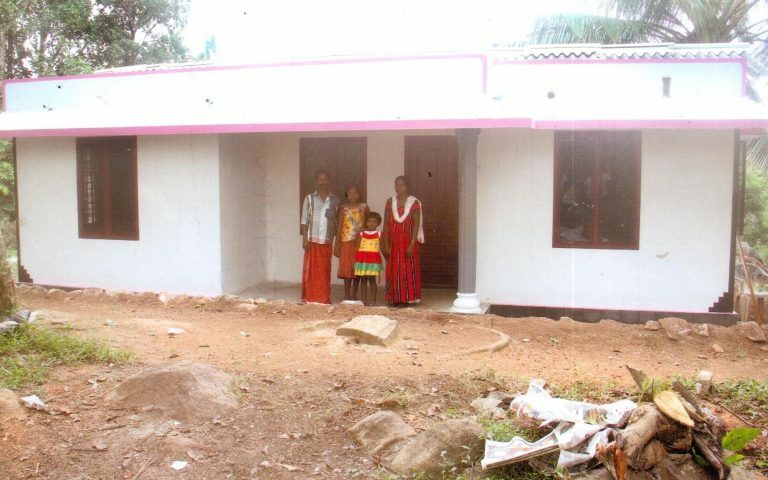 We are ever grateful to you to supporting us to build a house .We are contented with the new house. 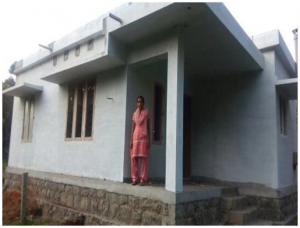 Especially our daughter is very happy to have a proper house because most of her friends are having proper houses and she was worried about not having a house to bring her friends as we were living in rented house. Both of us are sad about this .At present we are happy and thanking God for your love and concern towards us. Because of your mercy we could build a house for us. We remember you in our daily prayers. We experienced teasing form others not having a house. 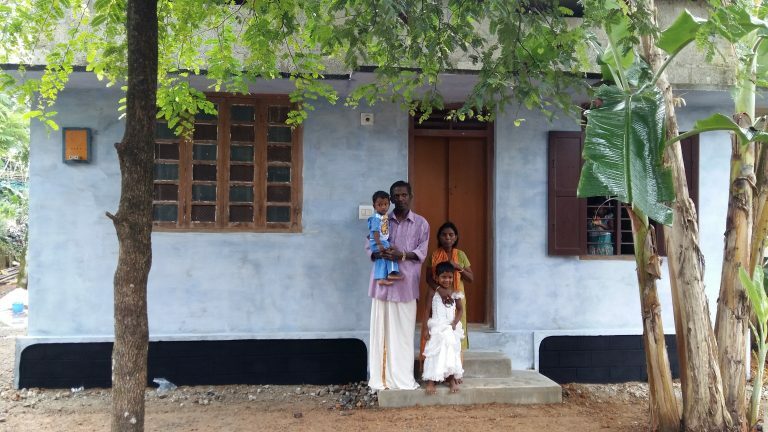 But now we are happy with our new house. 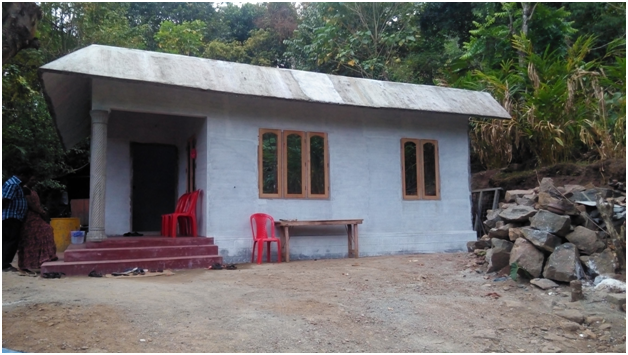 Really through you God gave us this house .We are happy and taking initiative for the parish activities. You are the reason for everything. Once again we thank you for your love and concern. Let me commence this thanks giving letter by expressing my earnest gratitude from the bottom of my heart for the generous help you extended to me and my family. In my family there are six members: four children, my husband and myself. 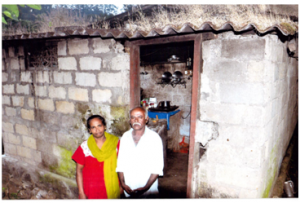 My husband is a casual laborer and we were living in a rented house. All my children are doing their schooling. The first three children are sons and they are in twelfth, eleventh and ninth standards. 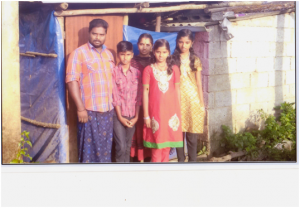 The youngest child is a girl and she is in seventh standard. With the grace of God all my children are doing well in their studies. One year back my husband met with an accident while returning from his work. Both his legs were broken; the knee-cap of one of the legs was shattered to piece and had sixteen stitches on the head. 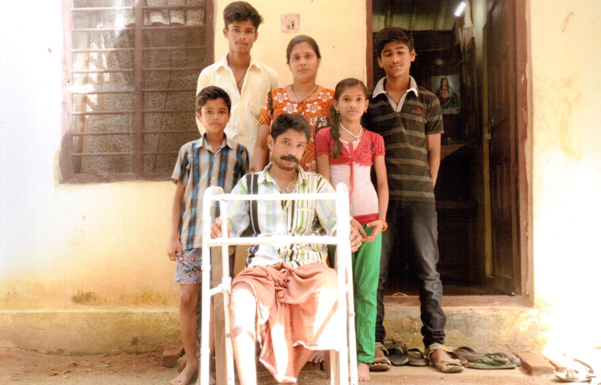 He was hospitalized for one month and due to proper medical care he has almost recovered from his impairments. During this period it was a hard time for me to pay the rent for the house, meet the household expenses and to take care of the educational expenses of my children. The help given during this testing time by my husband’s brother and other well wishers are remembered with immense gratitude. In the bleak days ahead of me, as the will of the providence, your generous and timely intervention came as a boon for my family. 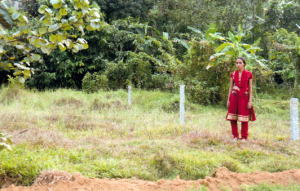 With the support we could procure a small plot and a house for our family. We are now living in our own house with no burden of paying rent every month. How can I express my gratitude for materializing a dream that I cherished in my mind for years. Each time I step into my house I remember you and your family and pray for your well being. Finally I thank Almighty God and praise Him for the wonderful thing manifested through you. 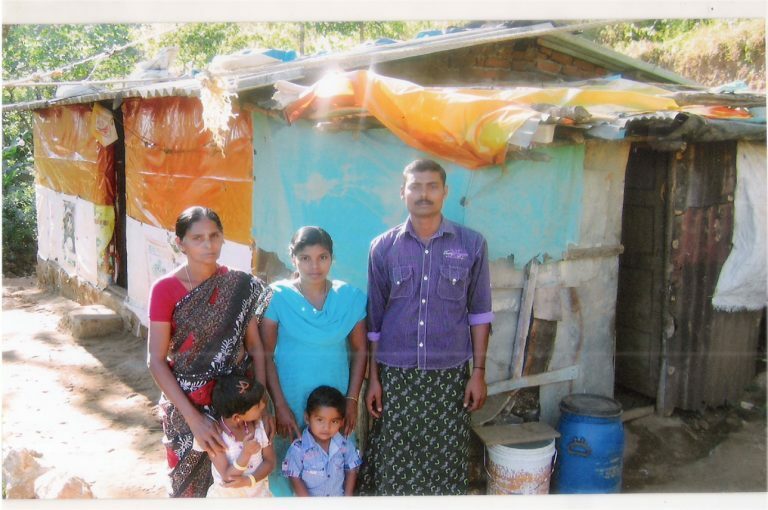 Paul Das, and daughter Sheeba Mary and family from Pambanar parish is writing this thanking letter. First of all, let me thank you for your great heart to understand our situation and helped us to build a house. Last seven years we were living in rented houses. 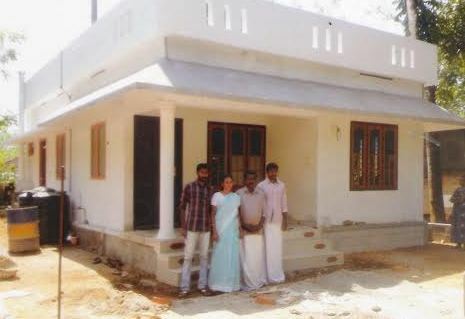 It was our dream to have a house for us. Your good will realized our dream. 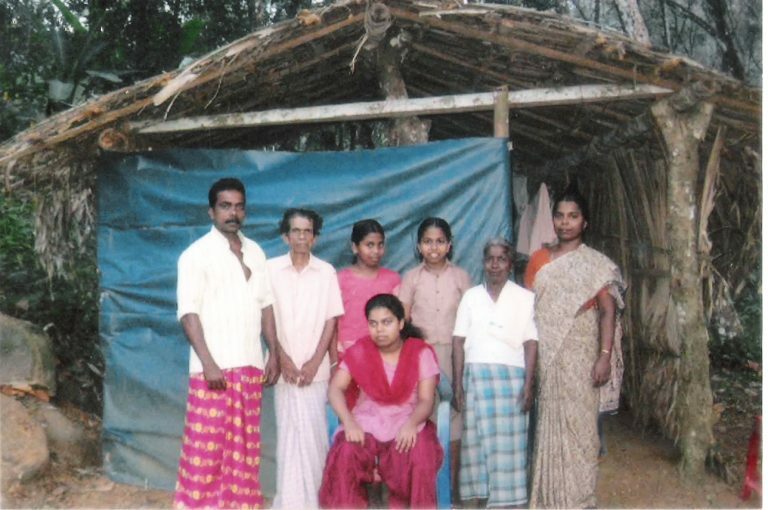 Even though I am paralyzed from birth I have passed tenth standard. I have trained for stitching. With the help of our parish priest through VSSS I have received one stitching machine . I am helping some of our neighbors for stitching. My mother is looking after the house works. My father is working in a private resort as watch man. Both of my parents are Diabetic and pressure patients. And taking medicine. 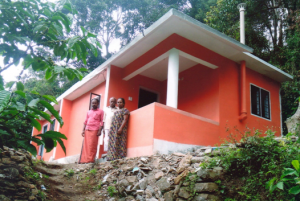 In our 3 cents of land we built a house with two small bed rooms, kitchen, toilet and a small hall. We have scarcity of drinking water. 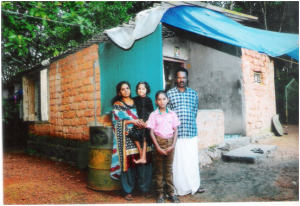 We take water from the bore well of the neighborhood. Once again I thank you for all your love concern and help you render to us even though you have not seen us .We do pray for you. How are you? Hope you are fine. We are all very happy to express our thanks to you for helping us to have a house. It was more than our expectation. We could not even have a dream about it to have a house so soon. 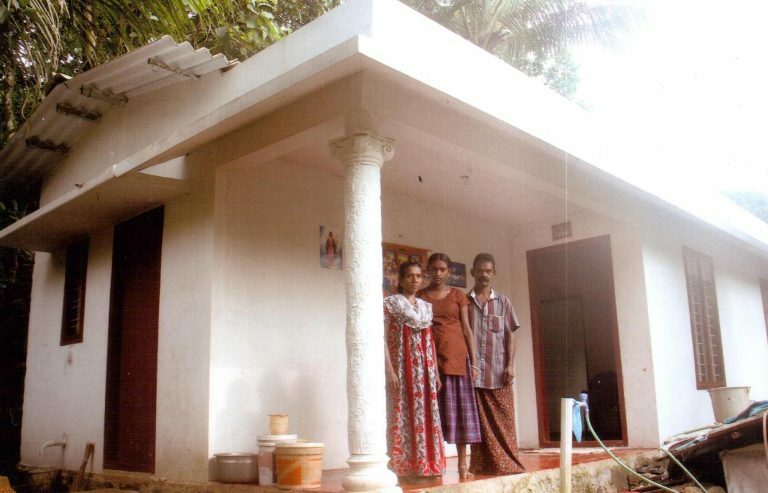 Without your help we would not have been able to construct a house. If we were trying ourselves to construct a house we would have been in a debt of large amount. Really God helped us by sending you who are so loving and owner of generous heart. We are fine and happy to live in a new house. Some work to put in order is left. We do not know how to thank you for the you have done for us to have a house. We assure our prayers. We pray that God may bless you with good reward for all that you do for poor. Hope you have reached safe in your place. We are so happy and we thank you and your friend to come over here to see us. We convey our love to you. We are not able forget the moment that aunt and friend came to our house. Myeyes were filled with joy when you came as a dovewho joy and peace, when my children welcomed you with roses , when you embraced my children and me . I felt the happiness that I never experienced. My husband, our mother and children and all our relatives and neighbors were so happy. We were so happy for the surprise gift that you have given. We liked your family photo. We thank you for all. We showed those who came to our house. Meera mol showed to all his friends and told all news. Did you like our place? Did you like cardamom, pepper and coco? Again when you come to India please come to our house. Did you like the well and water? The fish that eat small insects has 1kg. We feel little discomfort since the wall for well is not built. Now we are sleeping in new house. We will have prayer in our house in next week. Since it is one year that we were not able to have prayer in our family. This is not family prayer. We have a family unit of Catholic family. These families get together ones in a month in a family and pray together. 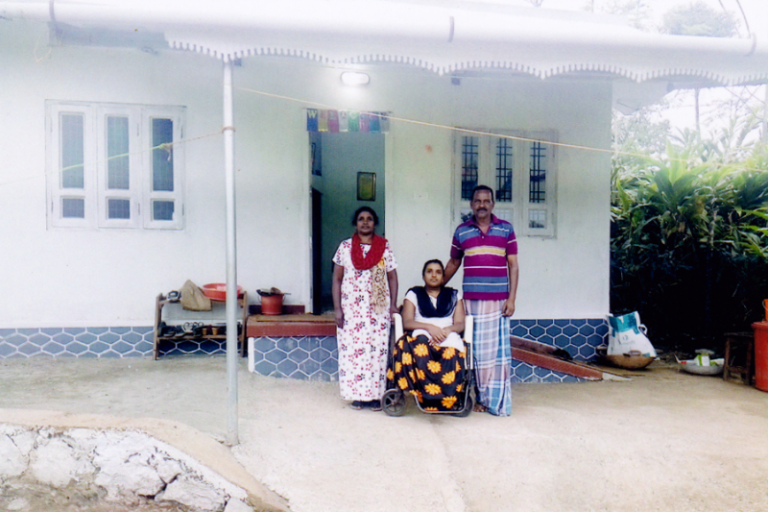 This year we received solar light as aChristmas gift from VSSS. So we have light in three rooms also. 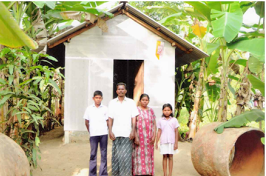 We thank you and other sponsors who contributed for the construction of our house. We remember you all in our prayers. 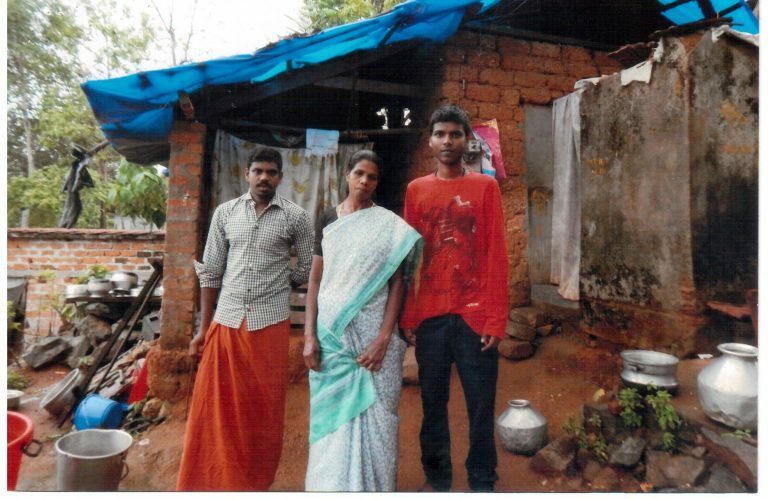 Arya Amil, Abin and Akhil conveyed their special regards to you all. All children were so happy with elders. After they go we felt as if one rain fall was over. Wemy husband , mother , my self, Meera, Meenu , Mahi were sad when all went. Still we remember the moments that we spent with you. When Fr. Dennies, our parish priest and all vsss staff and especially when you both came for the blessing of our house and we distributed the milk our dream was fulfilled. In this moment we remember all those helped us with you economically and materially our own neighbors and friend to finish the construction of our house. All the more we thank God for helping us each moment. 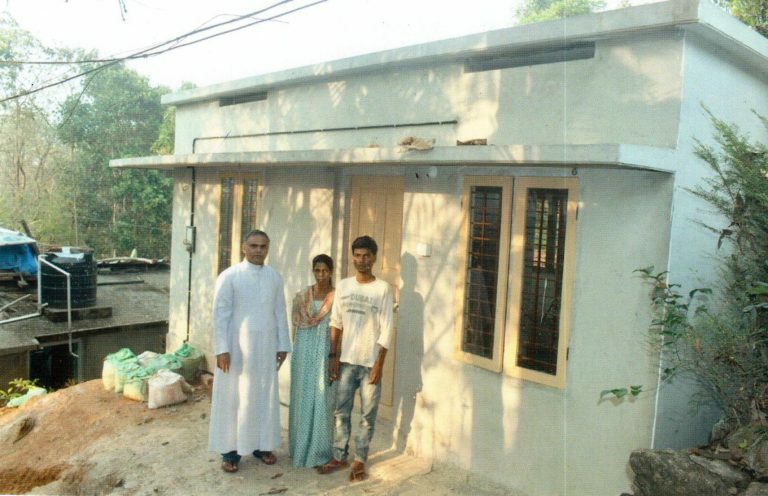 It is His grace that we could get this help and finish our housing. You are really a gift from God. We hope you will reply for this letter. We desire to know your opinion after coming to our house. We convey loving regards of all our dear and near ones. How are you all? Hope you all are fine. First of all I wish you all the blessings of Advent season. 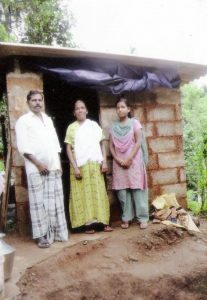 I do not know how to express my heartfelt thanks to you for helping my family to build a house. We realize that it was impossible for us to have a house with our own effort. But it was possible with the help of God and yours. 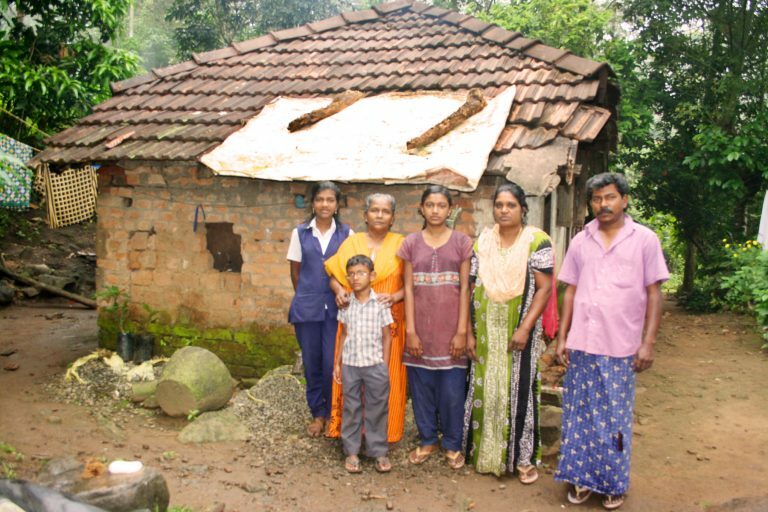 We believe that God worked through you to have a house for us. My wife, children and myself are so happy to have a house to live in. Now we are preparing for Christmas. Hope you too are preparing yourself to welcome Child Jesus. We experience the mercy and love of God through you. We pray for you that entire God may bless you and grand reward for your love and generosity. We conclude this letter by wishing you all A happy Christmas and Happy New year. How are you all? Hope you and your family members are fine. Here I am Abi Joseph with good news for you. Please convey my regards to all your family members. Here my wife children and myself are fine. I am going for work. My mother and my brothers and their family are fine. The construction of my house is finished. My small beautiful house consists of two rooms , a hall, sit out and kitchen. 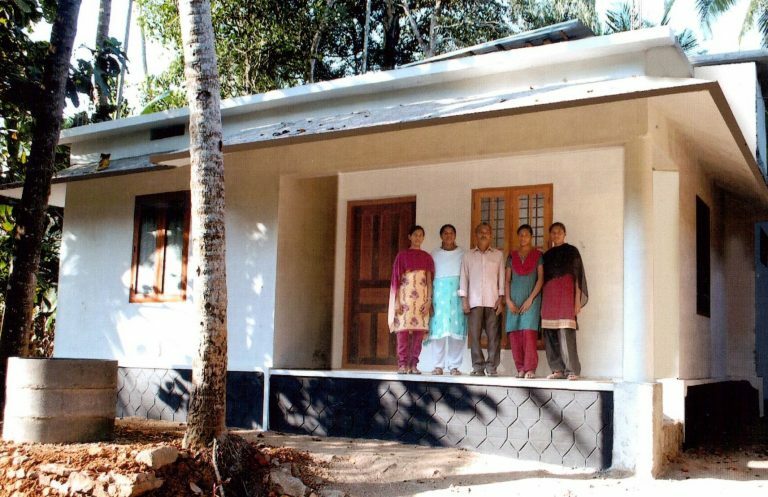 We thank you for helping us to have this beautiful house. We are so happy to have house of our own. Really we experienced the mercy and love of Christ for us through you. 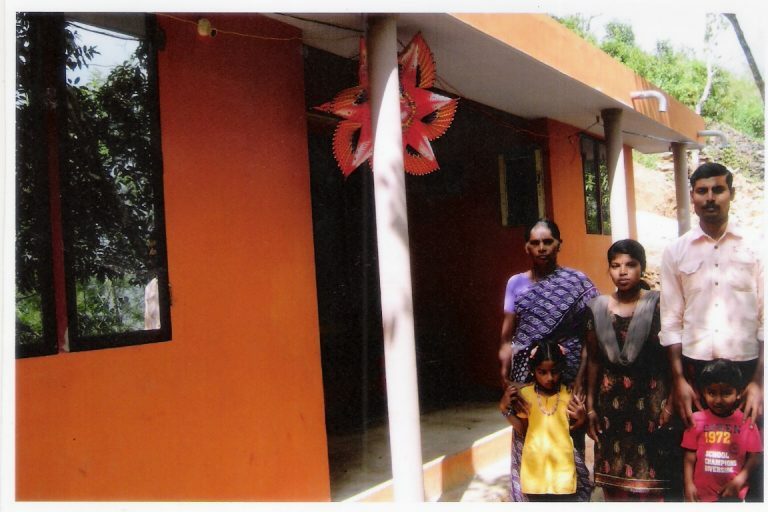 We will be grateful to you and your family for helping us to have this beautiful house. We remember you all in our prayers. By offering you thousands of flowers of thanks and once again wishing you all the best I conclude. How are you? Hope you are fine. 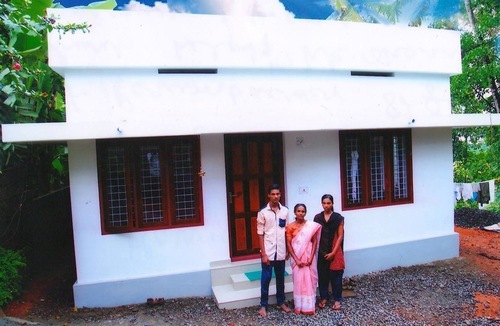 I am Antony K.M here to thank you for helping me to have a beautiful house. My family thanks you with great joy for your generous heart. To have a good house to live in was our desire and prayer. We thank God for hearing our prayers and inspiring you to contribute what you have to help my family. Really we experienced the love and mercy of God through you. How are your family members? Please convey our regards to all your family members. My father, wife, children, and myself are fine. We do not know how to express our thanks to you. Our house consists of two rooms, a hall, kitchen and a sit out. 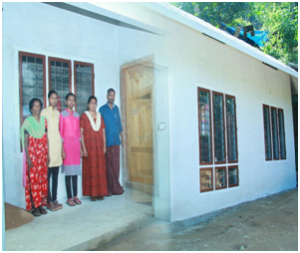 We are really grateful to you for the help that you did for us to build a house. We remember you always with grateful heart and pray for you all to have great success in all that You do. How are you all? Hope you are fine. I Valsamma is here with happy news and grateful heart. I do not how to express my happiness and gratitude towards you for helping me to have a beautiful house. First of all I thank God for choosing you to be an instrument in His hands to provide me and my children a beautiful house. It was my dream to have a house now it came to be a reality. 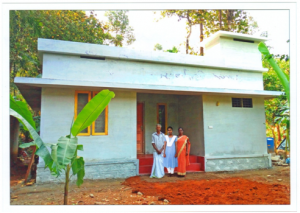 There are helps of much good heart to build this house. Our Parish priest and parishners helped us with many materials. MY son finished his +2 and my daughter finished her 10th standard. We are so happy to have a house. Once again we thank you for your valuable help. We pray that God may grant you good reward for all your help. Parishoner of St. Mary’s Church Thellakom. She is a widow. She has two sons . First one is a painter . The second one is suffering from Arthritis. She is a house maid. They have 3 cents of land. He has four cents of land. He is the only earning member of the family. He is 54 years old and has three daughters. First ones are twins and they are studying for degree. They are in first year. Youngest one is studying in +1. His wife is a house wife. Now they are living in a shed. 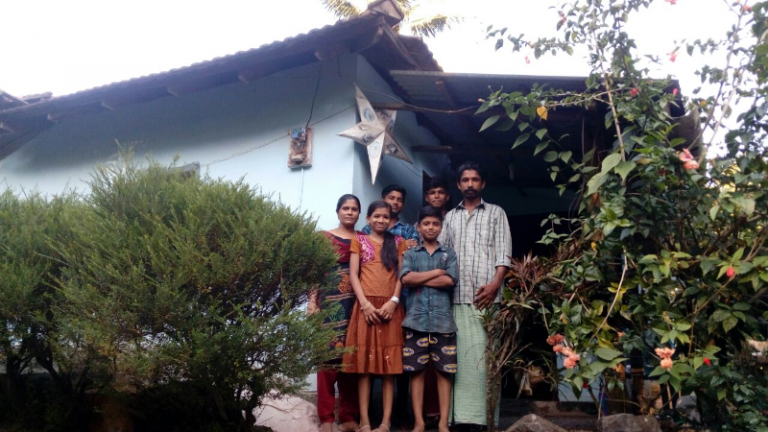 It is difficult for him to find for housing and provide for the education of the children. A casual laborer. 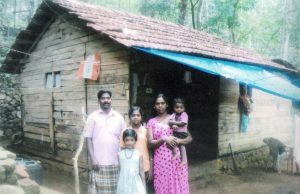 His family consists of his wife and two children. His elder daughter is studying in 5th standard . He has three cents of land, but has no house. A coolie worker. 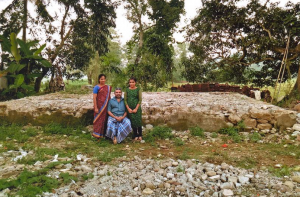 His family consists of his wife and daughter. 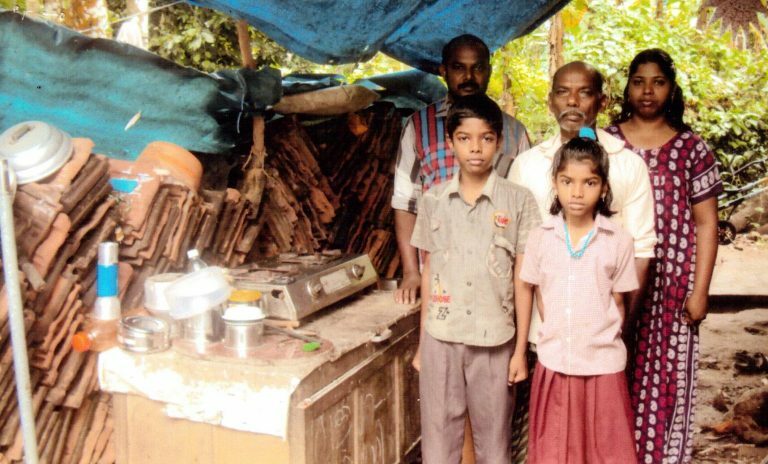 His daughter is studying in 10th standard. His wife has problem with uterus. So she is under treatment. He has 3 cents of land and have no house. 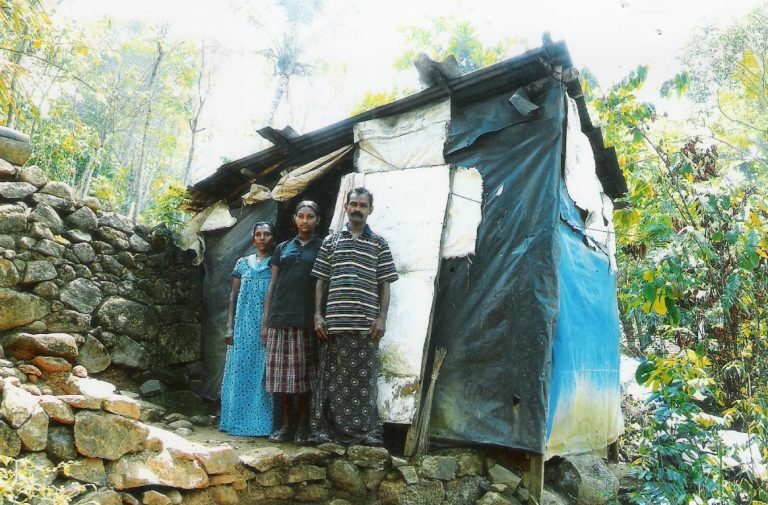 They live in a make shift house. 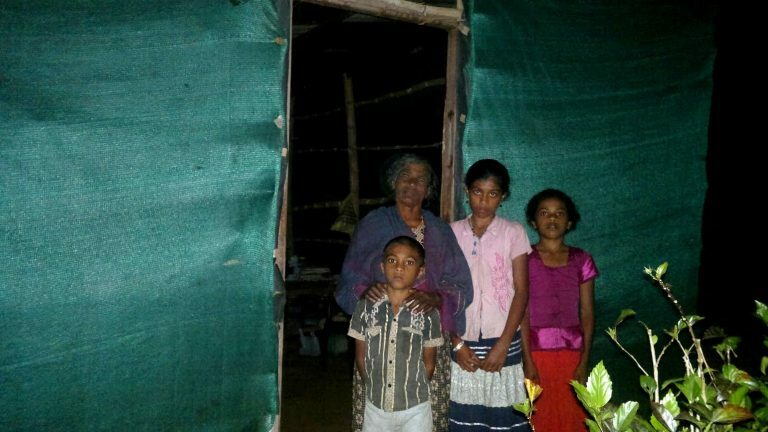 Grandmother who is taking care of her three grandchildren because their mother died of cancer and their father abandoned them to marry another women. Maria is 65 years old, sick, and doing casual work to feed three grandchildren. 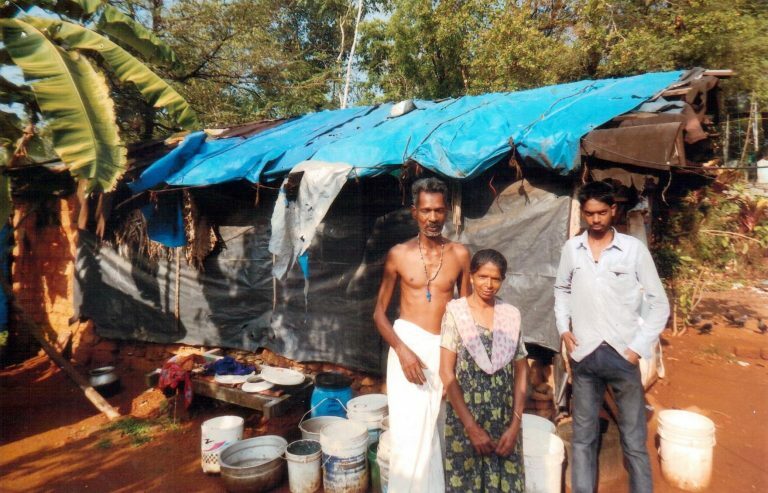 Joseph Sunny is a day laborer and the family has 10 cents of land. He suffers from spondylosis. Children are in the 7th, 6th and 4th grades. As you can see, their house is quite bad. John Joseph is a coolie worker. He has two sons. First one has a small job in a shop and second one is studying for computer. His wife is housewife. They have four cents of land. 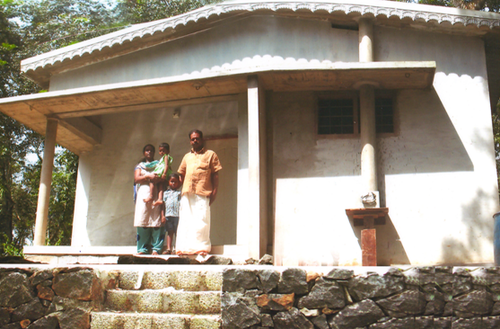 Thomas is a parishoner of Kuttikanam. 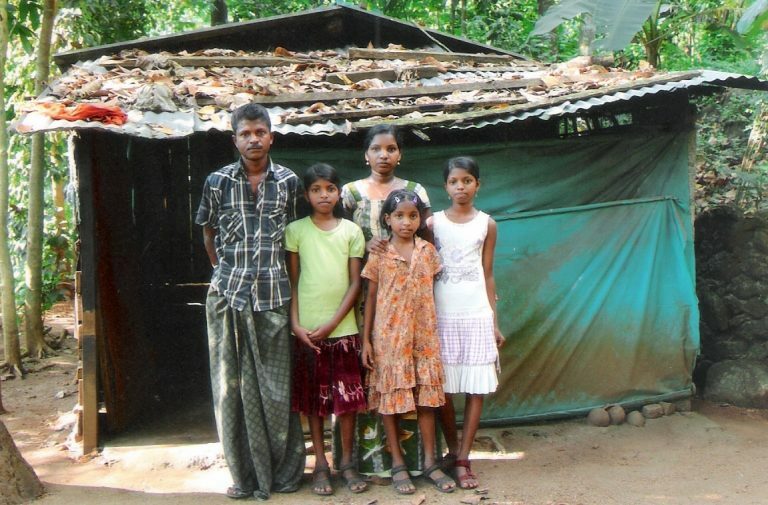 His family consist of five members, his mother, wife and his two small children. He is coolie worker. He has five cents of land as his own. 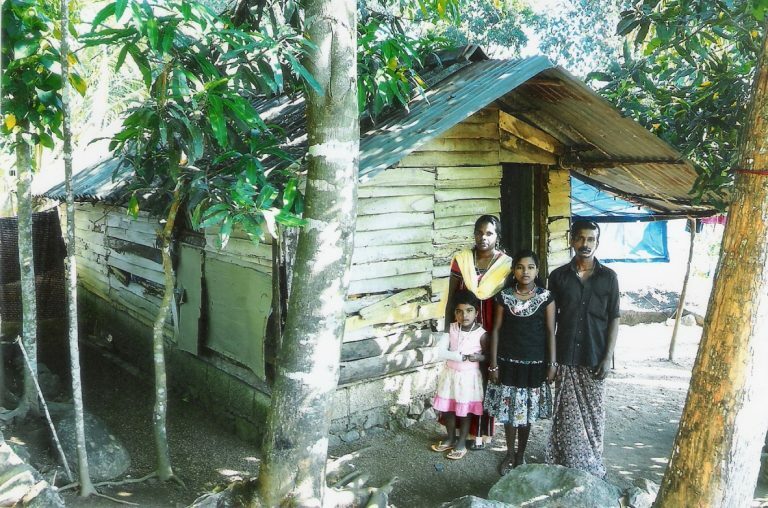 Matthew's family consists of his parents, wife and three daughters. The eldest daughter had some defect in walking so she had to undergo a surgery and now she is in treatment. 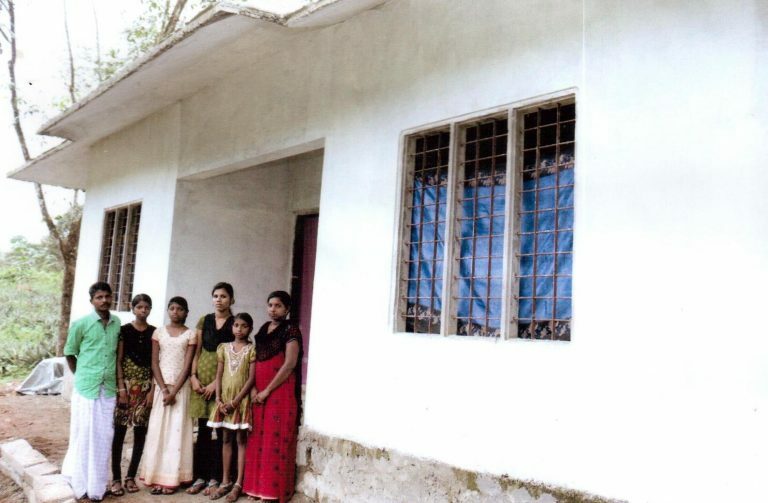 Since it is difficult for her to travel by herself she stays in a hostel near her school. 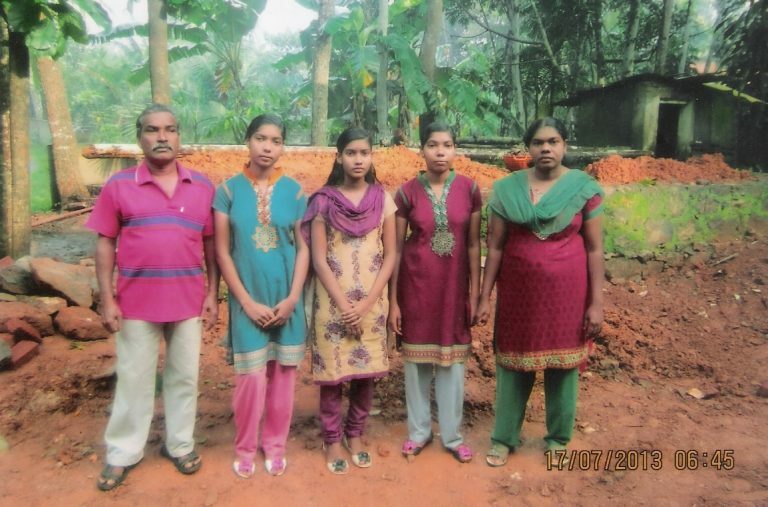 Second daughter is studying in 8th standard, the last one is in 6th standard. Matthew has 10 cents of land which is given by the owner of the land where they were living . He is a coolie worker. is a Parishioner of St.Mary’s Church Thellakom. He is a coolie worker and he is sick. His family consist of his wife and two children. The children are working . One is a painter and other one is salesman. They have 2 cents of land. 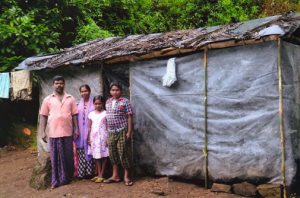 Now they live in a make shift house which can not be called as a house.